Up to 2% cash back every time you play. New and existing players - NO wagering requirements. Let’s start with the obvious here, Mustard Bet is an odd name for an online casino and sports betting site, especially as there is no themed slogan or tagline to explain the reasoning behind the title at all. It’s a strange name, but it’s also one you notice, which is important for a new site, which Mustard Bet is. Joining the iGaming world at the most competitive time in its history, and not only trying to crack one busy part of the market, but two, it’s fair to say that Mustard Bet has created quite the challenge for itself. We’ve seen many sites attempt to cover both casino and sports betting options, and traditionally it hasn’t gone well, especially for sites who start out trying to do both things at once. We’ve seen brands start in one field, build a reputation, and then move into the other, which tends to have more success, but when trying to put all their eggs in a single basket, statistically, Mustard Bet is likely to make a mess. That doesn’t mean to say it will though, so let’s take a closer look at this new site and see if Mustard Bet looks likely to succeed where so many others have not. The first thing you need if you really want to make an impact on the iGaming world, whether that be casino, sports betting, or a combination of the two, is a striking look that catches the attention of players. What Mustard Bet has created, is a boring look that is unlikely to raise the eyebrow of even the greenest novice of the online gambling world. There’s no references to mustard, which in terms of colour scheme may be preferable, but in terms of theme does nothing to explain why the site is called what it is, which we shouldn’t complain about really, that being about the most interesting thing about the Mustard Bet design. 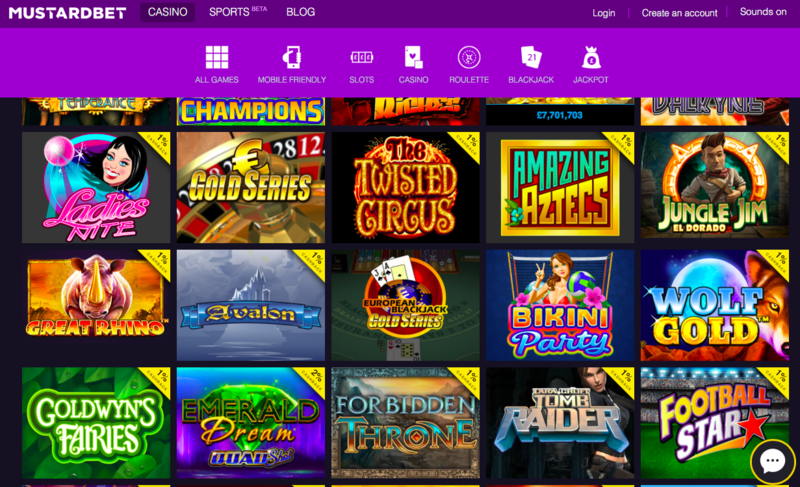 The colour scheme at both the casino and sports betting sections of the site is purple and just purple, white fonts over a few different shades of purple put together in blocks to give the impression of the least possible amount of effort having been put in. Navigation is simple enough, everything is clearly marked and there’s one click access to many games and sportsbook options, but none of that takes away from the dire design of Mustard Bet. It becomes something when you actually genuinely think an iGaming site could be more interesting if it was unattractive, as opposed to the dull, uninspired style one gets at Mustard Bet. With such a lacklustre design concept, it would be safe to assume that Mustard Bet would attempt to kick the door down in terms of the games collection on offer, especially considering its fighting in two markets, but, oddly, that does not appear to be the decision that has been made. Instead, the software across the entire Mustard Bet site comes from a small list of developers, Ainsworth, Microgaming, Playson, and Pragmatic Play, meaning that many of the most popular games in the casino world are not available here. The portfolio of games at Mustard Bet is limited as a result of this small list of (with the exception of Microgaming) lesser known software developers, leaving Mustard Bet with little chance of ever being seen as competitive. It should be pointed out that this is a site that is in the early stages of its life, and both the design and the games selection could improve, but if they don’t, Mustard Bet has little to offer anyone.